The Alexander McQueen-collection was an ode to The Ice Queen and her Court. 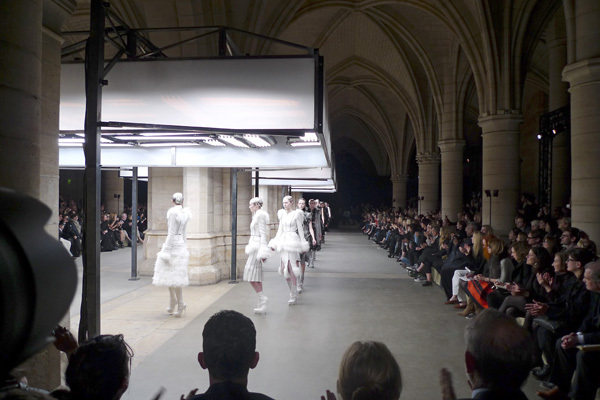 Sarah Burton – who’s talent and character keeps the McQueen-house alive and kicking – gave her heroines a colorless faces and small, metal-covered heads. 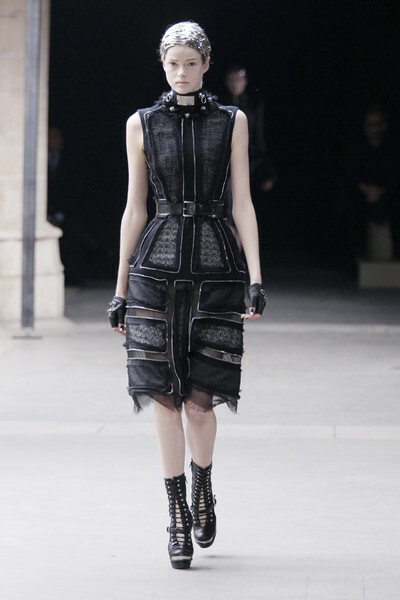 She build the collection slowly, using white, black and lilac and a very McQueen silhouette. It was molded, strong, and sometimes fitted like a harness. To avoid a too tough and edgy impression Burton tempered it wit hand-made silk and wool tweeds with litlle pieces of mink and fox. Other beautiful fabrics were checked and studded velvets and organza, and really stunning were two dresses with body’s made entirely from mosaics of broken bone china plates. The evening gowns were just breathtaking.